FoRP is applying for grants for a feasibility study to renovate the community shelter (the old and now closed toilet block next to the changing facilities). 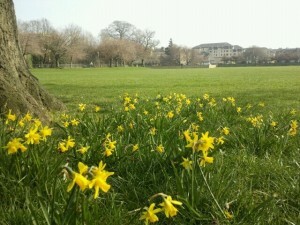 The Annual General Meeting of Friends of Roseburn Park will be held on Thursday 19 July 2012. Watch this space for time and venue. FoRP have been engaging with the City Council to help minimize the impact of the forthcoming flood defence works. The Park’s fabulous boundary trees are threatened by the works need to upgrade the flood wall (though we are assured that any damaged will be replaced by full grown replacements). And there is uncertainty over whether the playground will be cut off from the park by the new wall. All those bulbs planted by FoRP and Roseburn Primary School are brightening up the park. There will be more plantings next year. 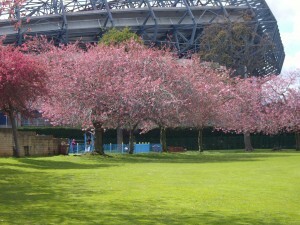 On Tuesday 22 May we held a meeting to discuss possible ideas for a Roseburn Park event. Numerous suggestions were made including dog competitions and kite flying competitions and highland games. Most likely to be held in the early autumn. Ideas and groups welcome.